Welcome to the website of Philip G Hodge – professor, backpacker, runner, opera reviewer, great-grandfather, nonagenarian. Professor Philip Hodge, member of the National Academy of Engineering and recipient of numerous awards in his field, died peacefully on November 11, 2014 in Sunnyvale, California with his daughter and granddaughter by his side. 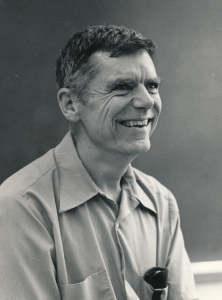 Professor Hodge was a key contributor to plasticity theory and published five books on the subject, several of which were translated into other languages. His research resulted in significant advancements in plasticity theory including developments in the method of characteristics, limit-analysis, piecewise linear isotropic plasticity, and nonlinear programming applications. He was an enthusiastic gardener, an amateur genealogist, a backpacker, and an avid marathon runner. At age 53 he climbed Mt. Ritter, and at 62 he placed 23rd in his age category in the Boston Marathon. He was a lifelong fan of live theatre and an enthusiastic opera supporter, and he wrote opera reviews until the year he died. Philip was born in New Haven, Connecticut to Philip Gibson Hodge, a New York publisher and Foreign Service Officer, and Muriel Miller Hodge. He received a BA in mathematics from Antioch College in 1943, where he met the love of his life, Thea E. Drell. They married in 1943 before he joined the US Merchant Marine, where he served through the rest of World War II. Upon his return he earned a PhD from Brown University in Applied Mathematics in 1949. In 1949 he became Assistant Professor of Mathematics at UCLA, then moved on to become Associate Professor of Applied Mechanics at Polytechnic Institute of Brooklyn in 1953, Professor of Mechanics at Illinois Institute of Technology (Chicago) in 1957, and Professor of Mechanics at the University of Minnesota in 1971, where he remained until he retired in 1991. From retirement to his death he was Professor Emeritus at the University of Minnesota and Visiting Professor Emeritus at Stanford University. Professor Hodge was thesis director for 16 Master’s theses and 18 PhD theses. He served on various committees of the American Society of Mechanical Engineers (ASME), and he was Technical Editor of ASME’s Journal of Applied Mechanics from 1971-1976. He was the longest serving secretary of the U.S. National Committee of Theoretical and Applied Mechanics. He was elected to the National Academy of Engineering in 1977, and he received numerous prestigious awards: the ASME Worcester Reed Warner Medal in 1975, the American Academy of Mechanics Award for Distinguished Service in 1984, the Theodore von Karman Medal from the American Society of Civil Engineers in 1985, the Euler Medal of the USSR Academy of Sciences in 1983, the ASME Medal in 1987, and the ASME’s Daniel C. Drucker Medal in 2000. He was an avid outdoorsman who loved long family camping trips and solitary backpacking trips in the Sierra Nevada mountains. In Minnesota, he took up gardening enthusiastically, along with running marathons. On his third attempt to climb Mt. Ritter, in 1974, he reached the summit (13,500 feet). In both 1982 and 1983 he ran in and finished the Boston Marathon (the first time with a broken leg), and in 1982 he won the Twin Cities Marathon in his age category. After retirement, Thea and Philip relocated to Palo Alto, California. Here they joined the Unitarian Church, and Philip started a Thespian play-reading group in the church that is still going strong after 20 years. He also began writing opera reviews for the online Splash Magazines, and enjoyed extensive travel. Philip and Thea had been married for 65 happy years when she died in 2008. He is survived by his three children: Susan Edith Hodge (David Aaron Greenberg) of Columbus, Ohio, Philip Tully (Marjorie Theresa) Hodge of Spring City, Tennessee, and Elizabeth Muriel (William) Hodge Kelly of Palo Alto, California; nine grandchildren: Aaron Hodge Silver, Myriam Hodge (Michael Lloyd) Cohen, Adam Hodge Greenberg, Jason Daniel Kubelick, Lisa Marie Kubelick (Tony Quinn Essex), Eli Nicholas Kubelick, Rivka Rose Kelly, Joshua Philip Kelly, and Eve Maya Kelly; six great-grandchildren: Ruth Tamar Silver, Perel Shifra Silver, Isaac James Essex, Hadassah Rayzl Cohen, Nitzana Sahar Cohen, and Ziva Ellie Cohen; his sister Mary Winifred Hodge (John Arthur) Frantz of Madison, Wisconsin; and many nieces and nephews. There will be a Memorial Service for Philip at the Unitarian Universalist Church in Palo Alto, California on Dec 21st at 2 pm. Donations can be made in his memory to West Bay Opera of Palo Alto or to the Unitarian Universalist Church of Palo Alto.